New Delhi: Paving the way for the return of e-rickshaws in the national capital, Delhi government today said it has started the registration of such vehicles. According to the government, two e-rickshaws have so far been registered with the numbers, ‘DL IR 001’ and ‘DL IR 002’. Transport Minister Gopal Rai said that the Delhi Finance Corporation has agreed to provide loans for the retro-fitment required to be carried out in the e-rickshaws prior to registration and that the same will be available at 13 per cent interest for a period of two years. Rai said that a simplified procedure for registration of e-rickshaws has been framed and pamphlets in Hindi have been printed containing information about the process. 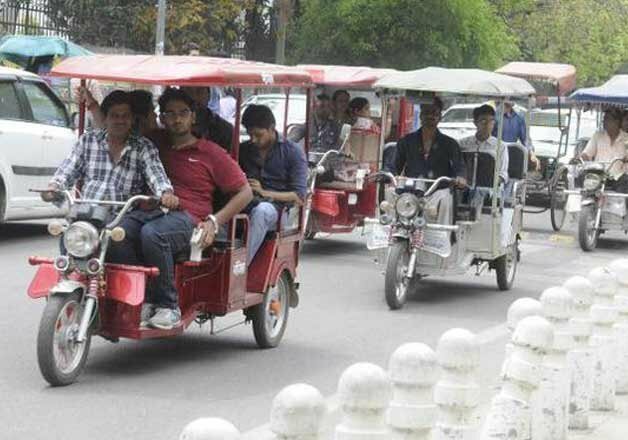 The transport department has approved seven models of new e-rickshaws. Once the manufacturers appoint the dealers for the sale of the e-rickshaws, interested persons can purchase a new e-rickshaw and get it registered. Till date, 24,441 learning licences have been issued by the transport department. Also, 22,984 PSV applications have been received, 21,833 applications have been forwarded for police verification, and 782 applications have been received after police verification. Meanwhile, as to a recent NGT order, Rai said that the transport department will conduct an open reality check on 10 year-old and five year-old diesel vehicles from April 21 at the Burari Authority. He also said that a target has been set of testing 100 commercial vehicles daily. Rai has also written to Union Transport Minister Nitin Gadkari for holding a joint meeting with the neighbouring states in this connection.